And please don't hate me, but I must tag you. Peer pressure and all. You understand. The wood? Who knows! Three other areas of my patio were decorated as well. The decorator is the five-year-old girl who lives next door. Her parents are in the middle of a remodeling project, hence the wood. 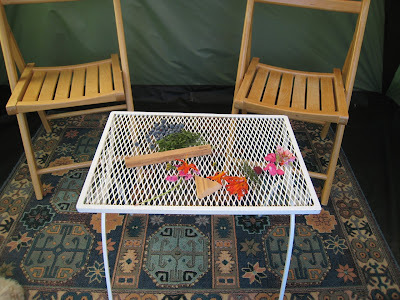 There was also a chair, not pictured, decorated with flowers and raspberries! I have taped a colorful "thank you" note to the table for her to find on her next visit. The is actually the second time I've been "decorated." I mentioned this to the parent the first time, and they were quite surprised.